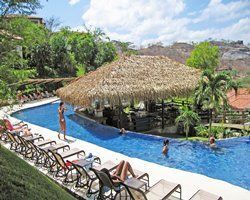 The Villas Sol Hotel and Beach Resort has been offering luxurious all-inclusive family friendly vacations for 25 years. 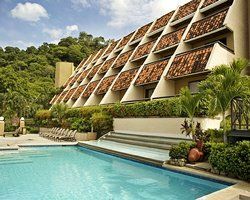 Come see what kind of paradise your family can experience with these Costa Rica timeshares for sale. This beautiful resort offers both standard style studio rooms as well as 106 villas, 50 of which feature their own private pool! 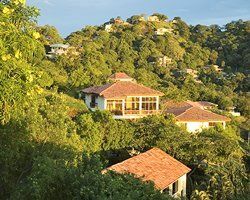 One, two or three bedroom timeshare villas can accommodate any travel party from three to eight guests with maximum comfort and plenty of amenities. 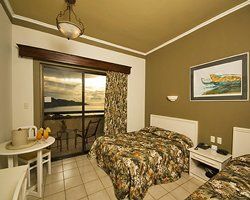 The standard studio rooms at Villas Sol Hotel and Beach Resort offer two double beds or one king sized bed. 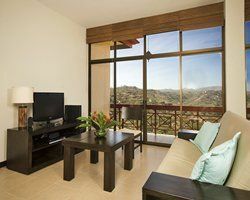 Standard amenities include central air conditioning, private bathroom with shower (hairdryers are provided) and private balconies overlook the Gulf of Papagayo. Your room also includes cable TV, telephone, alarm clock and safe deposit box. 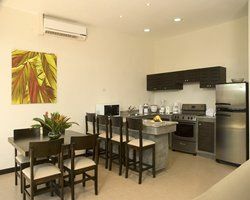 One bedroom villas feature one double bed and sofa bed in living room with a private bath featuring a tub and shower (hairdryers are also provided). The kitchen is fully equipped with silverware provided for up to a party of four. 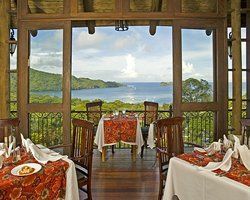 The terrace can feature a view of the Gulf of Papagayo. 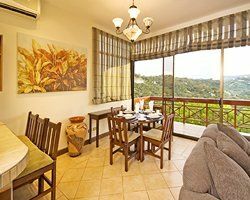 Two and three bedroom timeshare villas offer bedrooms with double beds and a fully equipped kitchen, and a living and dining area within the villa. They feature one bathroom (as outlined above) and can include a view of the Gulf and/or a private pool (subject to availability). Three bedroom villas offer the same accommodations with the extra room as well as an additional bathroom. 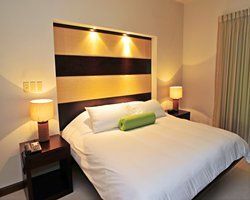 The all-inclusive option at the Villas Sol Hotel and Beach Resort will truly give you the feel of a luxury vacation with plenty of dining options on-site. Two on-site restaurants and three on-site bars cater to any guests needs. There is also a spa that offers a full range of treatments for the ultimate experience in luxurious pampering. The Villas Sol gym features basic fitness equipment such as treadmills, stationery bikes and free weights. 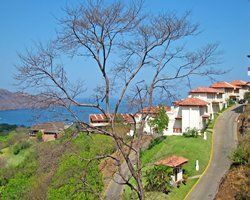 When you compare these Costa Rica timeshares for sale, there really is no comparison. 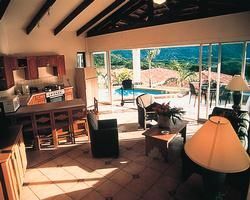 If you are looking for a terrific Costa Rica vacation with the discounts available on the resale market, check out the deals available here at BuyaTimeshare.com. Contact Villas Sol Hotel and Beach Resort Specialist Today! We visited Villas Sol Hotel and Resort December of 2014. 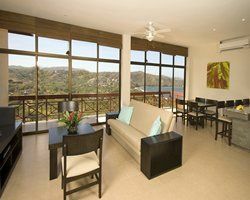 The Resort is located on a hillside overlooking a beautiful bay, just minutes from a fun beach. 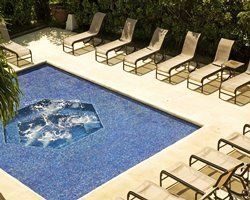 There are two pools on property (one with swim-up bar and snack bar) spa treatments are also available. Good food and drinks are plentiful. There is a shuttle service to take you down to the beach and back and also to take you to the quaint beach town of Hermosa, where you will find a variety of restaurants and shops. Variety of daily activities available on site. Tennis/basketball courts and water sports available. Very family friendly, beautiful grounds, and sunsets- friendly and helpful staff. 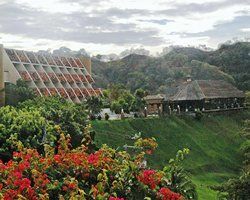 Fly into Liberia, Costa Rica airport and take shuttle to resort, approx 25 minutes. Additional excursions available through hotel. We had beautiful weather and a great time!